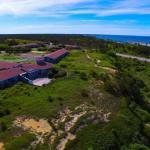 Boasting an on-site dog park this pet-friendly property is located in North Truro. Guests can enjoy the outdoor swimming pool and tennis court. A microwave refrigerator and cable TV are included in each guest room at Outer Reach Resort. You can enjoy a park view or sea view. Select rooms feature a balcony. The private bathroom is equipped with free toiletries. An array of activities can be enjoyed on site or in the surroundings including hiking. Guests have access to nearby bike trails and the property offers free parking. Pilgrim Monument is 9 minutesâ?? drive from Truro Outer Reach Resort. Highland Museum & Lighthouse is just 5 minutesâ?? drive.